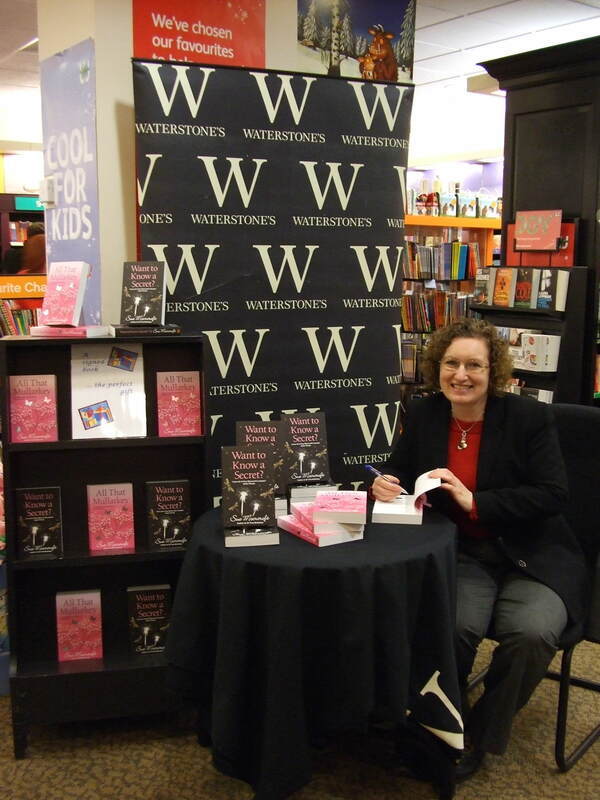 Booksigning at Waterstone’s, Northampton, just before Christmas. I loved being in the store – it had such a festive atmosphere and people kept giving me chocolates. Even at the back of the store, my hands were so cold at the end of the three hours that I could hardly hold a pen to sign with! The Manager, Emma, gave me a great display – don’t Want to Know a Secret? and All That Mullarkey look good together? The photo above shows me with manager, Emma. Hope everybody had a good Christmas – and received lots of lovely presents, namely books. Don’t forget, Want to Know a Secret? has been selected for the People’s Book Award and it would be great if you’d vote for it. Click here. Register. Click on the Want to Know a Secret? cover and using your email address, password and security code, vote. Thanks! 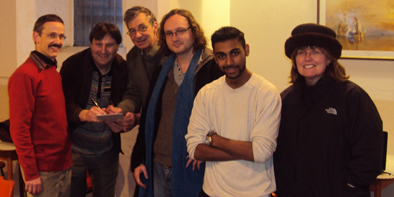 Brighton Cow will run four short story competitions in 2011. The deadlines will be the end of February, May, August and November. Their main writing competitions have an open theme with a 3,000 word limit. There are three prizes to the top three winning writers of £100, £50 and £25. There will also be the opportunity for the stories to be published on their website as well as being recorded for broadcast on Brighton’s Coastway Hospital Radio, which provides music and entertainment to a network of Brighton hospitals. The competition is just four pounds to enter, via PayPal or cheque, and the competition is open to writers worldwide. Stories can be submitted online along with payment or by post with a cheque. Brighton Cow will notify all entrants of receipt of their story. Each entry will be judged impartially and be read at least twice in full before judging decisions are made. They are planning some fun free to enter contests too. The first is a flash fiction- 250 word limit. Deadline 31st January 2011. Five song titles are on the site as themes. Three ten pound prizes and publication on site. Want to Know a Secret? selected for the People’s Book Prize! Want to Know a Secret? has been selected for the People’s Book Prize! This is a prize voted for by the public and it’s a buzz just to be selected. You can vote here – and I’d love it if you would. Hover over the book cover image and follow the prompts. Don’t forget the security code because you can’t vote without it. Awards such as the People’s Book Prize are important to writers and to publishers because they bring books that otherwise might not have been there into the public eye and provide a means for the public to have a say, rather than a board of judges that readers will probably never have heard of. So this is your chance to have a say, just with a few clicks. It’s an opportunity for you to be a judge in a literary competition! How can you resist? New Horizons – whoop, whoop! Starting Over will be coming out in Australia in April 2011 and All That Mullarkey and Want to Know a Secret? will follow in May. I’m thrilled to be going into another country and keeping the same gorgeous covers that Choc Lit has already given me. Although my books are available for download and global online sites, there’s nothing like being available on the shelves of bookshops in any given place. So, I’m doing a happy dance, today – which is one way of keeping warm, I suppose. On Thursday 16th December I’ll be in the Chat Room at BBC Radio Cambridgeshire once again, this time taking part in a show about family and money and which is more important – the theme of Want to Know a Secret? – with the lovely Sue Dougan, the last show I’ll do with her before she goes off on maternity leave. I really enjoy radio. And my revamped website has just gone live at www.suemoorcroft.com – do drop by and let me know what you think. But, fact is, I’d hate to be without Twitter, now. It’s not just a dumping ground for, ‘Oh no, not more snow!’ or ‘Whoo! Finished my first draft!’ Tweets (although I am guilty of those …). Twitter is just a brilliant resource. Is the A43 between Northampton and Oxford running OK? Yes, says a man in Towcester. I’m really stuck on a point of American law … Well, whaddya know? Within FOUR MINUTES – honestly – a wonderful lady (@romancemama) is put in touch with me through a mutual Tweep. She’s had 25 years experience in exactly the area I’m stuck on and sorts me out via email. And it was Twitter that got me my F1 column at girlracer.co.uk. I have to admit, there’s a whole load of stuff I don’t read on Twitter but it’s so brilliant for getting help from people! In exchange, I have offered help to others (I’m not a complete Tweetasite) and answer such questions as I can, about short stories and romantic fiction and whether dogs are warmer than hot waterbottles, on your lap. And, like most Tweeps, I just enjoy reading about the lives of readers, writers, Formula 1 drivers … Just about everyone you’re interested in has a Twitter presence. You can follow them easily. Or you can even follow me. This National Short Story Week competition was launched in Leicester on November 27th. The competition is based on the theme of gravity racing ( lean, clean and green cars without engines that race very fast downhill). All you have to do is write a short story up to 3,000 words about what happens next, after a gravity racer invades a football pitch and a different kind of foul play is suspected. What happens next is entirely up to you as long as the setting is hot weather. Your story from then on need not involve football. Pictured at the Gravity Racer Competition launch, the man behind the current Gravity Racing Car World Land Speed Record, David Ackroyd, gets his writing pen out to join some well known faces from Leicestershire’s writing community. First Prize is £100 worth of Thomson Travel Vouchers towards taking the winner to a warmer climate. 1. A short, fictional story written in English of up to 3,000 words that initially involves a gravity racer, a football pitch and hot weather. 3. The author’s name should not appear on any page in the manuscript. 4. The entry must be the original work of the author and be previously unpublished. 6. A Title page in a separate attachment must accompany the manuscript giving the author’s contact details. 7. Please keep a copy of your entry as manuscripts cannot be returned. 8. Entry to the competition is FREE but limited to only one entry per writer. 9. Closing Date: 31st January 2011. 10. The Judges decision is final and no correspondence will be entered into.